I guess there is a Sugar GTK theme that makes GTK apps look Sugar-esque even if they aren't fully Sugarized. But half of the tests fail and the responsiveness is horrible (like, click a cell and get a cursor 5 seconds later). I suspect the failing tests (and a good chunk of the performance problem) comes from Fedora using a different version of Elixir and SQLAlchemy than Leandro used. As the serious-minded mentor, I should have forbade the use of those still rapidly evolving libraries, but I couldn't resist the shiny either. 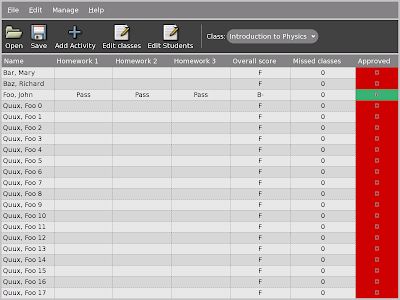 Jennifer really wants a gradebook for her XO (and I'm sure she's not the only one) and she can't connect over the school's network to use a web-based tool, so I'm going to have to take half a crack at making this usable.